The Tories run our Government and what a mess. The Tories run our County and it’s nearly bankrupt. The Tories also run Sedgemoor District Council and on May 2nd we can do something about that by voting them out and rebuilding our communities with Labour. Make the most of the opportunities from the tidal barrier. This is a £100m project with £1.3billion knock-on economic benefits. We need to ensure that benefits cascade to local towns and people. Lobby for opportunities to improve navigation on the River Parrett and encourage the use of our waterways for leisure without detriment to the wildlife. Enhance our local green spaces and parks. Promote the Meads Eco Park as a place of quiet enjoyment, whilst working with others to enhance the bio-diversity and wildlife habitat. Encourage walking and cycling in the town to improve health and wellbeing as well as putting Sedgemoor ‘on the map’ for touring cyclists and walkers. 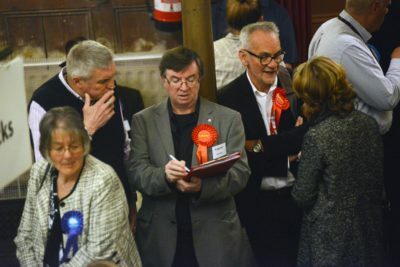 Town Leader Smedley and District Group Leader Lerry at the last election count. Follow the lead of Bridgwater Town Council and make Sedgemoor a ‘Frack Free Zone’. Promote green and low carbon energy providers and encourage our councils, local organisations and businesses to sign up with ‘green’ energy providers. Investigate opportunities to harness the power of our tides to create energy through tidal lagoons. Work towards ‘Transition Town’ status for our urban areas – an initiative to encourage grassroots community projects that aim to increase self-sufficiency and reduce the potential effects of climate change and economic instability. Continue to work with local councils and businesses to reduce throwaway single use plastics and encourage local organisations to sign up the Re-Fill initiative to discourage the purchase of bottled water and use tap water instead. Working with the Somerset Waste Partnership to provide adequate storage of refuse and recycling waste which will help to reduce litter on our streets and tackle fly-tipping. Encourage the use of green and spaces for a healthy community, such as Team events, Sport, Park runs and Buggy walks. Promote our natural assets such as the Coastal footpath, Canals and the River Parrett for tourism and leisure. Bid for grants and fundraising, to support the creative activities across the District. Promote the Carnival, Performing Arts, Festivals, Film and Music. Work with Towns and Parish Councils to create a network of digital Tourism marketing. Introduce a portfolio for Young People at Sedgemoor District Council. On Thursday May 2nd everyone will have 2 ballot papers. That’s 2 different ways to get rid of the Tories. Only a Labour vote can do this. UKIP are more Tory than the Tories, a party made up of Tory people, promoting Tory policies, bankrolled by Tory donors. The 2 UKIP councillors elected in 2015 have made no impact and have barely even spoken such is their one track obsession. Totally pointless on a town or district council. The real fight is with the Conservatives who have long wanted to break up the Welfare state and continually undermine local democracy by running roughshod over the wishes of local people closing down popular leisure facilities with the sole solution of an unwanted superstore only to find 4 years down the line that Flagship Tesco has run aground and voting their own executive members pay rises while underfunding public services. What a waste of time and money. The transport system is in a mess, our heritage is being reduced to rubble by developers with inadequate legislation to stop them and shops remain empty in our High streets. Labour has the ideas and resolve to provide solutions – promoting social enterprise , encouraging start-up businesses, innovation and technology centres. With our population increasing, especially with Hinkley C, we need more leisure facilities for these people. A big house building programme means that we need the facilities and amenities to support it. The Austerity programme of the Coalition produced a financial recovery for the few and not the many and we need to get it working for the many. The Labour Party works for everybody, people will be better off in secure jobs, we’ll have an NHS we can count on and only then can our country be a fairer place where we can give young people some hope about their future.